Established in 2011, Lake Effect Clarinet Quartet (LECQ) is committed to the performance of high quality chamber music, unbounded by style or instrumentation, that showcases the unique capabilities and versatility of the clarinet family. Comprised of voices similar to a string quartet, LECQ’s repertoire is focused on translating music originally written for other instrumentation into relevant listening experiences. As Vandoren artists, LECQ concertizes and presents clinics throughout the Midwest. Lake Effect has performed at the International Clarinet Association's Clarinetfest (2017), Vandoren Clarinet Ensemble Festival (2013), presented at the Vandoren booth at the Midwest Band Clinic (2013, 2014), and was invited to compete in the quarterfinal round of the 2012 Fischoff National Chamber Music Competition in South Bend, Indiana. Additionally, the quartet is in residence with Chicago Composer Jonathan Hannau at the Avaloch Farm Music Institute (2017). Members Nora Shaffer (Clarinet, E-flat Clarinet), Erin Miesner (Clarinet), Cally Laughlin (Clarinet), and Joseph Sanchez (Bass Clarinet) met while students at DePaul University. 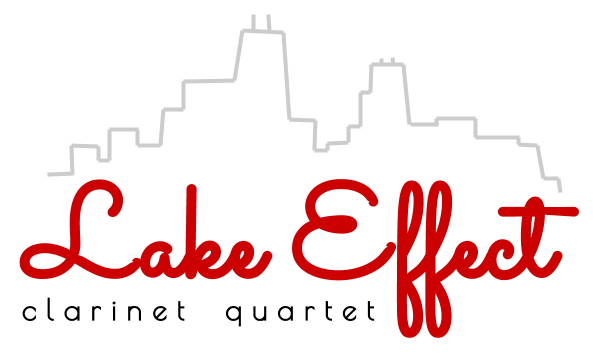 In addition to giving clinics and performances with Lake Effect, they are each active freelancers and teachers in the Chicago area. ​During time not spent perfecting the art of clarinetistry and quarteting, LECQ passionately pursues the craft of (s)wordplay, the art of matching outfits to their red shoes, and a deep, deep love of adorable kitty-cats.